dsread, a command-line SAS data set reader and converter. 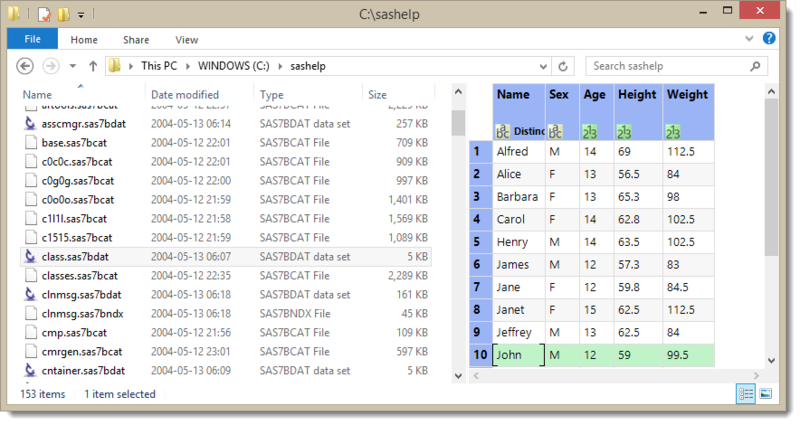 DsShell: a Windows shell extension for working with SAS® data sets, as produced by the SAS System, the World Programming System, StatTransfer and others. Choose the appropriate installer below, download it and run it - your browser may offer to run it for you, or you may need to double-click it to start the installation - this depends on your choice of browser. As DsShell is a Windows Explorer shell extension, you must install the correct version for your system - if you have 32-bit Windows, you need the 32-bit version of DsShell and if you have 64-bit Windows, you need the 64-bit version. DsShell works on Windows Vista, 7, 8, 8.1 and 10. No other software is required. You can download and install DsShell free of charge to make sure that it does everything that you want. If you want to carry on using it, you should buy a dsread license code via our payment partner MyCommerce by clicking here: BUY LICENSE CODE (a dsread license code is good for dsread and DsShell!). This costs US$75 for a lifetime license which will work with all future versions of both dsread and DsShell at no extra cost; please enquire for multi-user and academic discounts. Some functions of DsShell are restricted until you enter a valid registration code - only datasets created on 32-bit Windows platforms will be convertable or previewable in the trial version. To unlock all of DsShell's abilities, first buy a registration code at the link above, then right-click on any SAS data set and select DsShell's 'Convert to .csv' option. From the DsShell dialog click About... and enter the registration name and code you received by email when you registered. 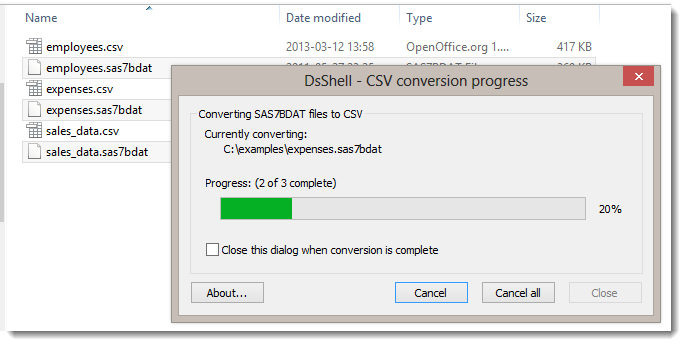 These screenshots show DsShell being used to convert first one, and then several, SAS data sets to CSV. Just right-click on the files in Explorer and choose the relevant 'Convert to .csv' option'. Preview Pane: The screenshot below shows the new DsShell preview handler in action. 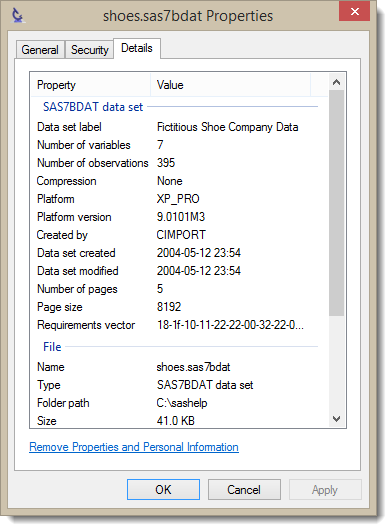 Simply turn on the Preview Pane in Windows Explorer, select any supported SAS data set, and view your data in Explorer - no additional software required. This dialog shows the full set of 12 properties currently supported by DsShell's property handler - you can add any of these to the Details view by right-clicking on a column header, selecting 'More...' and then scrolling through the list to find the property names as shown above. The Windows Search subsystem will also index all your data set files according to these properties, making it easy to search for data sets according to their labels, etc. 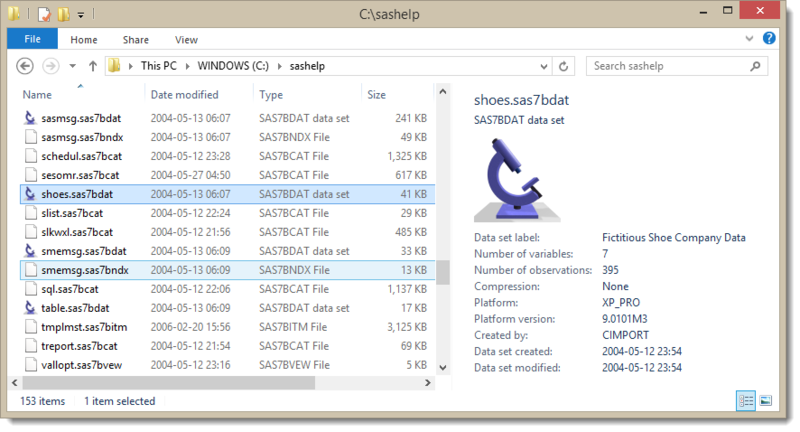 DsShell can read SAS data sets from a wide variety of platforms, including 32-bit Windows and Linux, 64-bit Windows and Linux, Solaris and others. The trial version will work with any data set created in 32-bit Windows format - other formats cannot be read until you register DsShell (just US$75 - see above for details). From the Start menu (or Start screen, on Windows 8/8.1), select the Control Panel, then 'Uninstall a program'. Select DsShell in the list of installed programs, then click 'Uninstall'. Despite thorough testing, Oceanview Consultancy Ltd cannot guarantee that the output of this software will be accurate in all cases. You use it at your own risk. It will work on most SAS7BDAT files, whether uncompressed or using CHAR or BINARY compression. It works best on 'clean' datasets, by which I mean datasets that are the immediate output of a data step or PROC. Using DsShell on other datasets, for example datasets that have been edited using FSEDIT or similar, might lead to strange effects like deleted observations being output. Note that DsShell will happily work on datasets that have a READ password. The password protection in SAS7BDAT files does NOT encrypt the data and DsShell doesn't even check to see whether a password has been set. You should not rely on a READ password to protect your data - use the ENCRYPT option for that. See SAS's rather cryptic warning about this here. Before attempting to read a dataset, DsShell checks its 'data requirements' information. If this isn't recognised, DsShell will stop with an 'Unknown data requirements' error. If you have a data set that triggers this error, please let me know () so that DsShell can be tested against it. Formats: DsShell ignores most formats and displays the underlying numeric and character values. The exceptions are DATE, DATETIME, YYMMDDx and TIME, for which values will be converted appropriately, though note that the length specified for the format will be ignored - that is, any DATEn. format will be output in the same format, whether it's DATE9., DATE12. etc. Compression: DsShell can read datasets compressed with CHAR or BINARY compression. Fixed more preview handler stability issues on Windows 7. Fixed preview handler stability issues on Windows 7. Preview and property handlers added. Greater range of file formats handled. Added support for the YYMMDDx formats. Added support for BINARY compression. Greatly improved crash-resistance and error reporting when an unreadable dataset is encountered. Adds a new supported platform. Now available in both 32-bit and 64-bit versions. As DsShell is a Windows Explorer shell extenstion, it's important that you install the version that matches Windows on your system - if you have 64-bit Windows, you need the 64-bit version of DsShell. Fixes a bug when converting wide datasets (those with over around 250 variables). Datasets from most 32-bit and 64-bit operating systems now supported, including Windows, Linux and Solaris.